DC will be using a very famous comic book storyline for their upcoming The Flash movie. 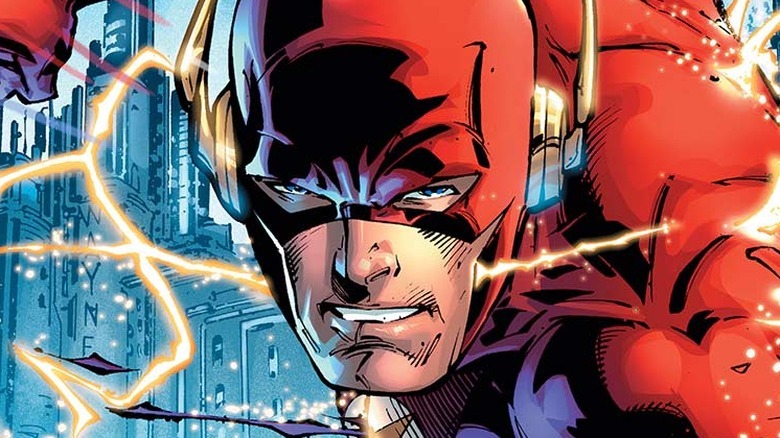 As revealed at San Diego Comic-Con (via Collider), the film, which will star Ezra Miller as the scarlet speedster, will be based on the 2011 comic book series Flashpoint, which came from the mind of DC Studios head Geoff Johns. Flashpoint, which was featured in season three of The CW's televised version of The Flash, features Barry Allen running back in time to prevent the death of his mother, something which has huge effects on the world. It's unclear if the movie will go down the same route as the comics, but there, Barry's actions led to some pretty awful fates for the rest of the Justice League. If The Flash really is going to cover these events, it will likely have a huge effect on the rest of the DCEU, something which should be interesting to see. One interesting use of Flashpoint could be as a way to pull Ben Affleck's Batman out of the DCEU. Although Affleck denied rumors at SDCC that he wants out of the part of Bruce Wayne, reports still say that Warner Bros. is trying to find a way to gracefully transition him out of the part ahead of his upcoming solo flick The Batman. Flashpoint could be a way to recast certain roles, should DC decide to go down that route. It will likely be a while before we find out exactly what DC's big screen version of Flashpoint will entail, as The Flash is still looking to find a director after shedding its first two. Still, though, hearing an official announcement that the studio has decided to go down that route offers up many interesting possibilities for the future of the DCEU, and it will be exciting to see how they pan out in the coming years. For now, read up on every movie that DC has planned.